Today Christians remember and celebrate how Jesus' promise to his disciples was fulfilled, that they would receive power to be his witnesses when the Holy Spirit came upon them. And they did. And they were blown out of their privacy onto the streets to take the message of Jesus to festival goers in Jerusalem and eventually, through them, to all the world. 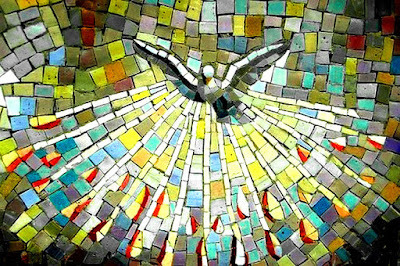 Here is the start of the Day of Pentecost story from Acts 2, the momentous occasion that gave birth to the Christian church in Jerusalem 2000 years ago. The problem for Christians hearing or reading a story like that can be that we freeze-frame it. It's easy unconsciously to box it in to a particular time and place and so not see how that story connects with our own stories. 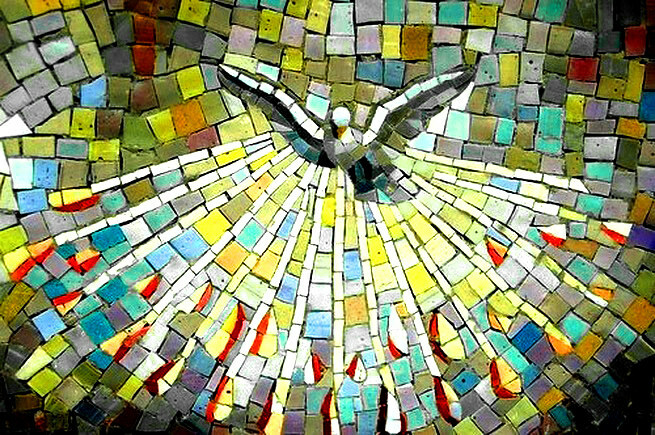 We can fail to see that the outpouring of the Holy Spirit is for all and for now as well as then. We can fail to recognize the Spirit at work in our lives and world today. We can keep the story only as a memorial of the past, safely contained within the pages of the Bible or portrayed in works of art to be admired. We humans like to be in control, know where the boundaries are. We even, in our pride, live as if we can control God, keep God within the 4 walls of a church or constrain him/her in theological systems or beautifully crafted liturgy. nor can she be captured, silenced or restrained." From the hymn, "She sits like a bird, brooding on the waters,"
We can pray, 'come, Holy Spirit' and be confident that prayer will be answered, but it may not be in the way we might choose. S/he may blow us out of our boxes, our comfort zones, bring changes and who knows what surprises.